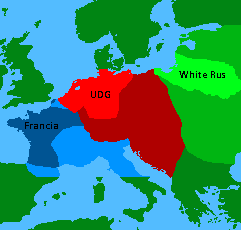 Under no circumstances should White Rus and the United Provinces of Germany declare a state of war between the two countries. This includes any kind of attack towards the two partners. To make sure this peace lasts. A border shall be defined between the two countries. It will be as follows: https://i.imgur.com/XCX6QXC.png . These claims will not be disputed. And will only apply once it becomes something relevant. If any of the two countries are declared war upon the other must join in defense. Karl von Stelzner, King of Germany, Duke of the Crownlands, Leader of the German Military and the Protector of the German People. To further bind this alliance it has been decided that King Karl's daughter Ella von Stelzner, aged 12 betrothed Griegor Rasputin Stanowskij aged 10. They will spend the summer in White Ruthenia and the winters in UPG. We think its time for a proper marriage now? They are aged 17, and 15.